Wake up in the morning refreshed and ready to go with the BeautySleep Wagner plush Mattress set from Beautyrest. Built for individualized comfort, a combination of gel foam and individually wrapped coils work together to provide pressure relief, back support, and motion separation for undisturbed sleep. SurfaceCool fibers that lay just beneath the fabric are designed to move heat away from the surface of the Mattress to help maintain an ideal sleeping temperature. GelTouch and AirFeel Foam layers provide support and maximum airflow for a comfortable sleeping surface. SurfaceCool fibers move heat away from the surface of the Mattress to help maintain an ideal sleeping temperature. 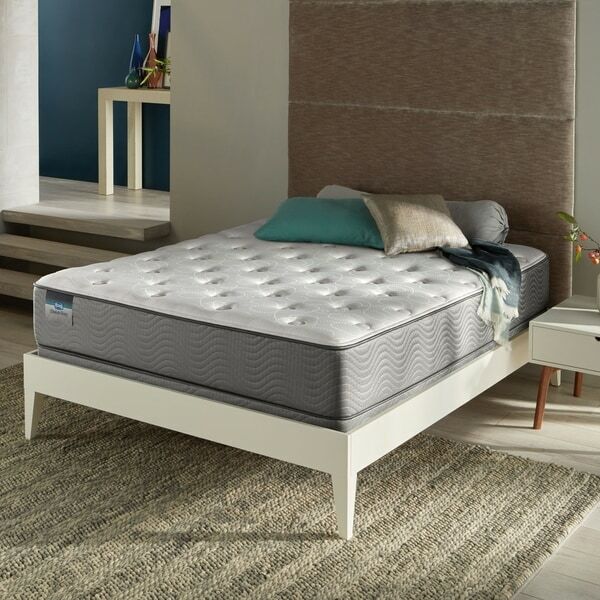 725 wrapped coils at the heart of the Mattress adjust independently to the weight and contour of your body, providing long-lasting support and enhanced motion separation. AirCool Foam helps provide airflow through the Mattress. Foam-Encased Edge-Support System maximizes the Mattress's sleeping surface. It took about two weeks to receive the mattress, which was decent. The delivery was easy and on time. Overall, the mattress is comfortable, but I do feel it already kind of sinking in the middle. I would say it's not the highest quality, though it's comfortable enough. Definitely more soft than firm. I think it's perfect for a guest bedroom, maybe less so for everyday use. We bought 2 sets of these beds in December and set them up the first week of January 2014. My husband and his brother travel a lot for our business, so they needed new beds in their IL apartment. These beds are TERRIBLE! After just 3 months of OCCASIONAL use they feel like they've been slept on every night for the last 20 years. I wouldn't recommend these to anyone. DO NOT BUY THESE - DO NOT! I should mention that most nights my husband sleeps on this bed alone, I occasionally travel to our apartment in IL so it's rare that two people are ever on this bed together. My husband also doesn't sleep on this bed every night, as he often comes home or travels to another state. If you are sleeping on this bed every single night, you might get a month of two of comfort. This mattress is meeting the needs of our son who just graduated from college and is back home. It arrived tightly wrapped and protected. It provides good back support. I was skeptical purchasing a mattress online without trying it out but was pleasantly surprised with this purchase. I would recommend this Simmons Beauty Sleep. The very best mattress set we have slept on. We couldn't believe the comfort level of this Mattress set at the price we paid. The Simmons BeautySleep Kenosha Plush Queen-size Mattress Set is extremely comfortable, I use to experience back problems sleeping on my previous mattress. I love this bed! We originally purchased this as a full size mattress for our daughter's room as she went from a twin size bed to a full. When hers arrived and she laid on it for the first time she was so relieved to have a mattress that was so soft but yet firm enough to offer excellent support. She raved about how wonderful it was and told her dad and I that we had to just lay on it for about ten minutes. Well....we were sold! Our previous mattress was a ***** as was our daughter's and they didn't last but three years, so we were skeptical because even after only a couple of weeks the ***** began breaking down. You can feel the difference in the Simmons right away! This is an amazing mattress offering comfort with it's soft, huggable feeling yet just the right amount of firm for total support for a pain free night's rest! If you're old enough to remember the Looney Tunes cartoon where the kitty cat is trying to make a bed out of the family dog's fur and then settles in for a perfect nap...that is the way this bed feels! haha I say...Go For This Mattress..You Will Not Be Sorry! I bought this set for my guest room but I have slept on this bed and find it to be very comfortable. I like the fact that I was able to purchase a low profile box spring so that the bed was not too high. This mattress is very comfortable and very good quality. It is soft at the surface and just the right firmness to keep you feeling comfortable all night long. If we ever receive it. Stay away, you'll never know if you will receive the item. We just bought this mattress set for our guest bedroom, and it is better than expected. The delivery was smooth and as expected. I would definitely recommend this bed! This mattress is beautiful to look at but much too firm for my skinny body. Unbelievable purchase experience. Great price (sale and coupon), quick turn around, fast delivery. I've heard so many horror stories about deliveries, but this team really did a fantastic job, right on time. And the mattress set is just great - super comfortable. Thank you so much, Overstock.com! this a grea t item. i love the look and the feel. it is a great value for the price and quality of the material use in making the product. i will recomend it to friends and family.i love this item. It's ok for a guest room but not for everyday use. We bought this mattress for my teen daughter and it’s even more comfortable than the one we purchased for our king bed. Every house guest we’ve had makes comments about how well they sleep on it. Great buy! Very nice and comfortable queen mattress. I have purchased a few mattresses here on Overstock over the years, much prefer it than going to a mattress store! This bed is extremely comfortable! 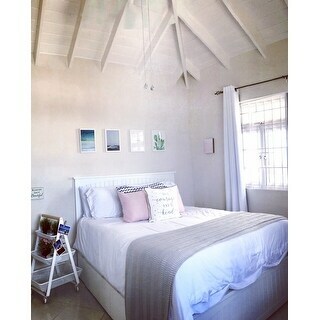 Love my bed and gives me a restful night sleep. Is just amazing. My husband just loves the mattress also. He sleeps like a baby and we both wake up well rested. I would recommend this as 1st choice mattress. I really like this mattress. My sister liked it so much when she stayed over that she ended up buying the same mattress for her house. I only use it when I visit my dad's house because that's where it is, so I don't use it every day. But I am pleased with it when I'm home. I bought this for my daughter, she loves it. She said it's very comfortable. The price was right as well. Definitely would recommend the purchase. Went to a local mattress company to test comparable ones from Simmons before purchasing this one. Construction is fairly lightweight but the foam layered interior is quite comfortable. Not exactly pillow-top plush, but cushioned enough if you're a side sleeper. Great value for the price! Let's hope it lasts. It has not even been a year and the mattress is awful. It sinks in, wish I could return it. I had a bad feeling about it when I first got it because of how low it sunk in when sat on, and laid on. Wish I had returned it. My husband and I get back pain from it. DO NOT BUY!!!! I bought this mattress set for my parents for Christmas. My mother is overweight and has back issues. This mattress is comfortable and still supportive! Everything people need to sleep! She reports feeer issues and a better night sleep. Excellent purchase! "are these independent or continuous coils"
"Can the mattress be purchased without the box spring?" "I'm actually looking for this bed frame but cannot find it on Overstock. Thougths?" "Is this same as Kenosha Place II?" "Will I have any trouble finding sheets that fit.Is it considered deep pocket or will most queen sheets fit?" I didn't have trouble finding sheets. This is my daughters bed, by far the most comfortable bed in the house! "Does delivery include haul away of old matress?" Hello erni1234, this item features white glove service which does include removal of your old mattress and packing materials. Please let us know if you have additional questions. Thanks for shopping with us. "Does this mattress come with the box spring/frame?" Hello malikdubai, this is the mattress and box spring only, it will not include a frame. You can refer to item number 13497251 for a frame. Thanks for shopping with us!